People who have taken the herbal formula Airborne with the hope of curing or fending off the common cold are eligible for refunds from the company. Airborne will pay $23.3. million to settle a class action lawsuit over false advertising. Legal battles beginning in 2006 called into question the product's claims as a "miracle cold buster." "You can say your product prevents or cures the common cold if you have data to support that," said Ronald Turner, professor of pediatrics and associate dean for clinical research at the University of Virginia School of Medicine. "What happened with Airborne is that they made the claim, but had no data." 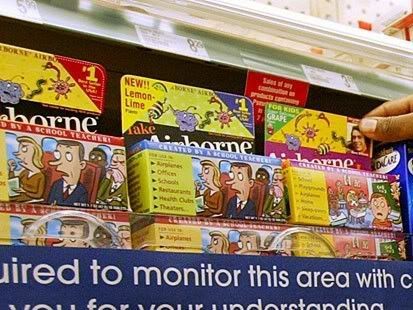 Since its creation in 1999 by a former second grade schoolteacher, Airborne sales have soared, surpassing $100 million by 2006. The product has been touted as a way to ward off a cold if taken prior to entering a germ-laden area, like an airplane or school, or to cure a cold that's already been caught. Airborne and many other remedies are classified as dietary supplements, not drugs, which means as long as they don't make specific health claims, they don't have to prove to the government that they work. But a February 2006 investigation by ABC's "Good Morning America" found Airborne might not work as advertised. The investigation revealed that Airborne's clinical trial was conducted by just two people in the absence of a clinic or scientists. At that time, Airborne's CEO, Elise Donahue, resisted the notion that Airborne is a cold remedy. "I would never sit here and tell you that it's a cure for the common cold," she said. "We don't know if Airborne is a ... cure for the common cold. What Airborne does is, it helps your body build a healthy immune system. When you have a healthy immune system, then it allows your body, on its own, to fight off germs." Since then, the company has toned down its claims, and the word "cold" is no longer anywhere on the packaging. A recorded message today at Airborne said, "Defendants deny any wrongdoing or illegal conduct, but have agreed to settle the litigation." According to the recent settlement agreement, people with valid claims will be reimbursed for the amount they spent on Airborne from May 2001 through November 2007 if they still have receipts. Consumers without receipts are eligible to receive money back for as many as six packages each, based on average retail prices of the products. Those prices range from $2.75 per box of Gummi lozenges to $10.50 per box for Airborne Seasonal. The difficult part is, how many people actually saved their receipts for a product they bought back in 2001 that they assumed worked? I'm willing to bet none. I wonder what's in it. I always take Echinacea if it looks like I'm getting a cold. It wasn't spectacularly useful when I was working in a primary school: I had at least three colds a term (except the summer). This winter the whole family except me had colds. So maybe it works. We don't have Airborne in the UK so I don't know anyone who's used it. The list of "other ingredients" includes: Citric Acid, Sorbitol, Sodium Bicarbonate, Natural Orange Flavor, Polyethylene Glycol, Aspartame, Mineral & Canola Oil, Riboflavin. No artificial colors, flavors or preservatives. I'm not thrilled to see aspartame on that list either given all its issues. People could be getting more nutrients in a better form, just by getting a decent multi-vitamin. And if a cold starts coming on, pop a vitamin C every couple hours to help ward off the initial start of the cold before it can get too bad. I'm surprised they don't have to say exactly what's in it. Suppose you're allergic to something in it? I think you're right. A hefty dose of vitamin C is probably more use! i swear by airborne.... i believe the idea behind it.. the fact is when you have a healthy immune system you are more resistan to colds.... it is fact... but... sad for them like anything else.. people will look for anyway to make a buck... no one looks at the possitive! False advertisement. No way. It says right on the box, "Helps Support Your Immune System". Nothing about curing your cold. We live in a REACTIVE world. Rarely do I see something live PROACTIVELY. That's the problem. People with colds looking for a quick fix. Airborne is a supplement like a piece of fruit. I'll keep buying the product. Stay on the shelf Airborne!